As the Southern California Chapter Chair of the Explorers Club I have the privilege of meeting some amazing people. One of those amazing people is Dr. Laurie Marker who runs the Cheetah Conservation Fund in Namibia. I met Laurie a couple of years ago at an Explorers Club function in New York and then my wife Diane and I hosted her at our home before she spoke at the Los Angeles Adventurers Club. When she was here Laurie said, “If you are ever in Namibia come visit.” Little did we know that I would soon be there and visiting the CCF was one of the highlights of my Namibian trip. The tireless work Laurie does at CCF is nothing short of remarkable. 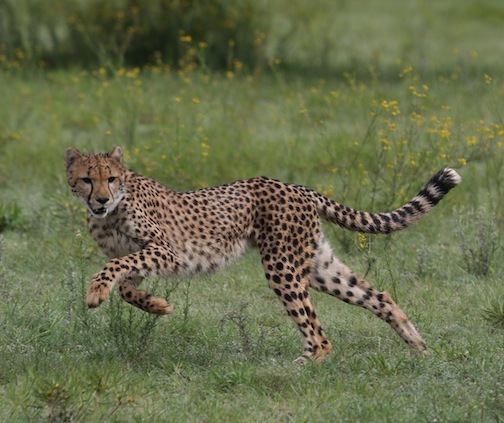 With an international contingent of volunteers, interns and staffers she is literally saving a species and educating thousands of people around the world on the need to save endangered cheetahs and the importance of this effort. I arrived at CCF after dark so I couldn’t see my new “neighbors.” It is somewhat shocking to wake up the next morning, open your curtain and see a cheetah walking by your window! But that’s life at CCF. Laurie was a gracious host and one of the highlights was to watch “the cheetahs run.” Some of the cheetahs that Laurie has rescued can never be released in the wild so they are kept as ambassadors to help people understand their beauty and the need for preserving them. To keep the big cats healthy, Laurie sets up a large track of rope attached to a car battery with a small motor with a scented rag attached. Then, much like the mechanical rabbit that dogs chase on a track, the motor makes the rope move and controls the speed, and off the cheetahs go chasing after the scented rag. 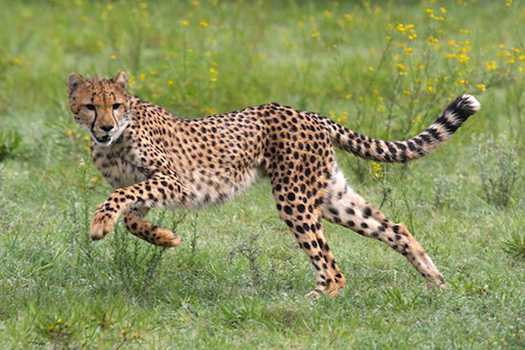 If you want to see something beautiful watch a cheetah run about 40mph around a field making tight turns like a feline race car. Not only can you witness this beauty but you can also be thankful you are not some gazelle or warthog being chased after because it would be no contest.